The Walter Camp Football Foundation has announced the names of forty “players to watch” for its 2016 Player of the Year award, the nation’s fourth-oldest individual college football accolade. 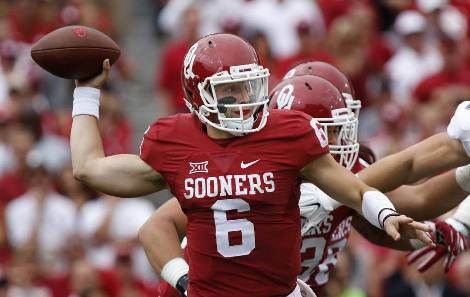 Oklahoma senior quarterback Baker Mayfield, a First Team Walter Camp All-American in 2015, along with Clemson junior quarterback Deshaun Watson, a Second Team Walter Camp All-America selection a year ago, headline the 2016 Watch List. Mayfield accounted for 3,700 passing yards and 36 touchdowns for the Sooners, while Watson passed for 4,104 yards and 35 touchdowns for the Tigers. Twelve players on the 2016 watch list, including 2015 First Teamers Leonard Fournette (LSU, running back) and Myles Garrett (Texas A&M, defensive end), have previously earned Walter Camp All-America honors. In all, 31 schools and 11 conferences (including independents) are represented on the list with national runner-up Clemson having three players. There are offensive players (15 quarterbacks, 11 running backs and four receivers) and 10 from the defensive side of the ball (5 linebackers, 5 defensive backs and 1 defensive end). The watch list will be narrowed to 10 semi-finalists in mid-November. The 2016 Walter Camp Player of the Year recipient, which is voted on by the 128 NCAA Bowl Subdivision head coaches and sports information directors, will be announced live on ESPN SportsCenter on Thursday, December 8. The winner will then receive his trophy at the Foundation’s 50th annual national awards banquet on January 14, 2017 at the Yale University Commons in New Haven. The Walter Camp Foundation is a member of the National College Football Awards Association (NCFAA) which encompasses the most prestigious awards in college football. The 22 awards boast over 700 years of tradition-selection excellence. Visit www.NCFAA.org to learn more about our story. The members of the NCFAA unveiled their preseason watch lists over a 12-day period this month. Sixteen of the association’s 22 awards selected a preseason watch list and the NCFAA has spearheaded a coordinated effort to promote each award’s preseason candidates.